Eastern philosophies have always considered mind an immensely powerful force to keep the body healthy. That winter was severe and a dismal chill descended upon Boston. Snowstorms blew through almost every day, or least that was what it seemed like. I walked from my home through piles of snow and muddy sleet to catch the early morning red line train to go to Massachusetts General Hospital where I was working. I sat in the train, but my mind wandered. My mind shifted to the northeast corner of the Dorchester Metro station where usually a barely clad old man, almost shivering, stood with a cap asking for alms. He wasn't there that day. For some reason, I felt sad but did not know why. Maybe because I was so used to seeing him there. I would occasionally push some coins or a dollar into his outstretched hand, which he always graciously accepted with a smile. I felt sad for a moment. Dark, gloomy sky, frigid blowing southern winds, poor visibility and a temperature nearing negative 20 degrees centigrade created the requisite milieu for such a mental state. I soon realised the effects of this sadness on my body, owing to years of study in medicine, and personal experience with meditation that I had started at the age of six. Depressed mental state is a harbinger of cancer, heart disease, and even death. It is something that you just cannot entertain. It is like having a small porch in front of your house where instead of growing flowering trees, you are planting weeds. The same it is with the brain; the one organ in your body that defines who you are. You cannot afford to cultivate any negative thoughts as your thoughts will create your physical reality. Despite over 50 years of innovative research in medicine and molecular biology, our knowledge about the human brain and its functioning has remained elemental. Little or nothing of what we traditionally call "mind" is thoroughly understood. In particular, the idea that the mind and the body have a medically significant relationship - where the state of the mind controls the well-being of the body - is relatively new to Western medicine. However, this concept has been an integral part of Ayurveda, a traditional Indian medical science, for ages. Ancient texts, including the vedas, upanishads, and other scriptures considered to be the fountainhead of Indian philosophy, propounded this principle. Practicing physicians and surgeons of ancient India, like Charaka and Sushruta, emphasised the importance of the right mental state for healing. They proposed that the state of one's mind governs the entire existence of the human being, including physical health. The nearest that Western medicine has come to this concept is in the study of the origins of certain diseases - called psychosomatic illnesses - where mental states like fear, anger, and anxiety can cause disease. Intricate mind-body links, in which emotions directly affect the body function, have not been scientifically palatable to human biologists until recently. In the past few decades, an explosion of scientific explorations that support the contention that mental states like happiness and sadness have a direct consequence on the body's ability to fight diseases, has occurred. The actual physical and biochemical changes occurring in the brain and the body - the elusive hidden links that intricately connect the mind and the body - are beginning to be deciphered to a certain extent. These discoveries have led to a new paradigm of thinking. For instance, today, if a person with a "common cold" presents himself before a doctor within weeks of a personal tragedy, such as the loss of a loved one, the doctor is unlikely to dismiss these two events in the patient's life as disconnected and merely coincidental. 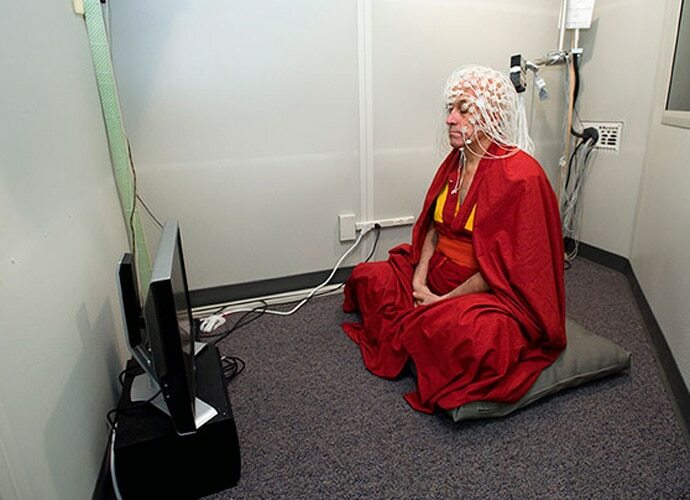 Brain mapping as a Buddhist monk meditates. The human body is exposed daily to a broad range of harmful bacteria and viruses. Our bodies have a highly specialised immune system to fight these constant menaces. It consists of an army of blood cells that have varying capacities for neutralising invading microorganisms - either by devouring them or by releasing chemicals that deactivate them. Some are highly specialised cells such as T (thymus-derived) cells and NK (natural killer) cells that directly kill both cancers and virus-infected cells in the body. Anything that depresses the function of these blood cells can make one vulnerable to infections like the common cold or other viral infections of the respiratory tract. Sandra Levy, a psychologist at the University of Pittsburgh's Cancer Institute, monitored 36 women afflicted with highly advanced breast cancer. Her study of those who survived the longest showed that one of the two most influential factors was a high level of happiness and joy (measured by scores on a standard questionnaire). The study also showed that the prognosis of breast cancer patients depends on the activity of the NK cells (which directly devour cancer cells); and also, that stress causes the release of certain chemicals in the body that decrease the activity of the NK cells - thus augmenting the cancer spread. It is therefore not surprising that research on various relaxation techniques that promote inner peace, including meditation, suggests that they can measurably assist the mind in enhancing immunity against cancer. The Eastern philosophies, which are the fountainhead of knowledge on meditation, have always considered mind an immensely powerful force to keep the body healthy and also to destroy physical diseases. Ancient Indian philosophy texts, unabashedly declares that man's soul is master of his mind and that his mind is master of his body. As he believes, so he is. Today, modern science is beginning to pay attention - as evidenced by the use in advanced medical clinics of visualisation, meditation, relaxation techniques, and other ways of activating the power of the mind. Promising results with a variety of diseases, for example, hypertension, cancer, irritable bowel syndrome and asthma have been documented. Inappropriate mental activity including rage, anger and hatred can cause a propensity for heart diseases, including increasing blood pressure and heart attack. It is indeed a fascinating story to learn how the perception of the human brain, visualised by Western medicine to be a static, genetically predetermined organ over which humans had little if any control, got transformed overnight into a dynamic, ever-changing instrument whose structure and function we can control to a great extent. Another age-old belief was that distinct parts of the brain performed specific functions. Based on this, it was assumed that if one part of one's brain was damaged or stopped working, then the brain would cease to conduct the function relegated to that part. This concept gained ground for the first time due to the pioneering work of a French physician called Pierre Paul Broca. Meditation research has effectively annihilated many such archaic concepts. A brain is a powerful machine that gets remodelled on a daily basis. Accumulated research has substantiated that our normal brain, which, let us call, "Broca's area", gets converted into a powerful machine that shifts our very existence to a different paradigm - a prototype of disease-free existence, longer life span with self-confidence, determination, and drive. This capacity of the brain to get remodelled is called neuroplasticity, and a brain thus augmented functionally is what I call, the "Buddha's brain": an organ that concatenates into one dynamic entity that propels positive thoughts to create acceptable reality. The wondrous thing is that it is something that all of us can do by practising meditation. Whether one is a busy executive or a graduate student, a few weeks of meditation can bring in massive changes to one's very nature. People become calmer and less stressed out. Memory functions better. Self-confidence skyrockets and addictions get less demanding and easier to control.